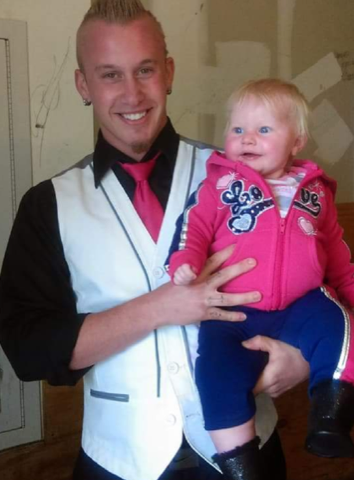 Joshua Dillion Grams, 25, passed away suddenly April 14, 2018. Born in Nashville, June 20, 1992, Josh was the son of Melissa M. Grams and the late James C. Day. Josh worked as a home remodeler and carpenter. He had attended MTSU and was a veteran of the Tennessee National Guard. Josh had a personality that was larger than life. He had been a lifeguard at the YMCA. Outgoing and friendly he liked to present himself with his own sense of style and care for his appearance. Josh had many piercings and tattoos including “Elli Jean” a rose on his forearm and also a dragon tattoo that went over his shoulder and down his back. He was also known for his wild hairstyles. His interests were varied but encompassed a love of motorcycles, going downtown and being part of the “Nashville scene”, being an MMA fighter and taking adventurous trips. He was also a singer, dancer and artist. He loved animals, particularly pit bulls and iguanas. He was a loving a devoted father, son, brother, grandson, nephew and friend. He leaves to cherish his memory, his mother, Melissa Grams; his sister, Ashton Grams; his brother Mathew Craig Bonna, Jr.; his daughter, Elli Jean Grams; his son, Alexavier Scott; his grandparents, Charles and Elsie Grams and Mary Martin; his uncle, Mark Grams; nephews, Sean Jeanne and Eli Grams; his niece, Sofia Jeanne; and Elli’s mother, Miranda Burnett. A Life Celebration Service for Josh will be held Sunday at 3pm in the chapel of Cole and Garrett Funeral Home in Goodlettsville. Visitation will preceded the service from 1-3pm prior to the service. I didn’t personally know Joshua. But I’ve lost people in my life and I know that the pain is indescribable. My thoughts and prayers are with all those mourning the loss of Joshua. One scripture that I’ve found comforting is Revelation 21:4.~~And he will wipe out every tear from their eyes, and death will be no more, neither will mourning nor outcry nor pain be anymore. The former things have passed away.”~~ I hope that some comfort can be found with family and friends as they cope with such a difficult loss. A wonderful son of a wonderful mother, you left this life too soon. You are in a better place, but those you left behind have less joy in life for losing you. Josh I’m going to miss ur handsome face…R.I.P fly high watch over us we love you going be missed and never forgotten..
We would like to express our deepest sympathy. May it help you to know that the hearts of others are deeply touched by your loss. Take comfort in knowing that every single tear that falls from our eyes,doesn’t escape our loving Heavenly Father’s notice. In Revelation 21:4, He promised to wipe away all painful tears.